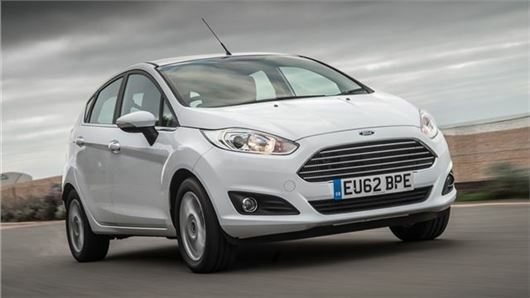 UK Car Discount has the following deals across the full range of brand new Ford Fiestas. All cars are brand new and supplied by UK main dealers. Home delivery is free and savings of as much as £2938 are available. The Fiesta Style features as standard 15" steel wheel covers with 12 spoke wheel covers, air con and pollen filter, 6 speaker radio/CD/MP3 player with USB and AUX inputs, front electric windows with one touch control on drivers side, electrically operated and heated door mirrors, body coloured rear spoiler, front and rear bumpers and tailgate handle, body colour door mirrors and Ford MyKey. The Fiesta Zetec model adds 15" 5x2 spoke alloy wheels, 3 spoke leather trimmed steering wheel, ambient lighting, chrome belt line finisher, chrome tailgate handle, flow through centre console, trip computer, heated windscreen, illuminated footwell, illuminated glove box, halogen projector headlights with daytime running lights with silver surround and front fog lights. The Titanium model adds 16" 15-spoke alloy wheels, power foldable mirrors with puddle lights, LED day running lights, Sony DAB audio system with SYNC, EATC air conditioning, lumbar seat adjustment, rear privacy glass, automatic headlights and windscreen wipers, auto-dimming rear view mirror, centre console with arm rest, perimeter alarm , velour floor mats and cruise control.